Super 30 Test Series: We will provide 30 sectional tests. Each sectional test is an item set based test. Each sectional test has five item sets. Each item set contains 6 questions. The duration of each sectional test is 90 minutes. Each test checks your comprehensive knowledge of one individual sectional subject. 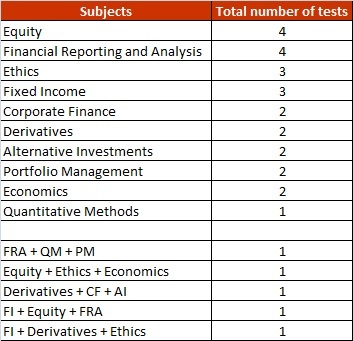 The tests cover almost all the topics comprehensively. We believe that if you can score more than 70% in our tests, then you should easily pass the CFA level II exam. The difficulty level is slightly higher than the actual CFA exams. How to use the product: First 25 sectional tests will be individual subject tests. First of all, you need to attempt those to check your in-depth knowledge of the curriculum. After that, the next 5 sectional tests will be combo tests of 3-4 subjects. After finishing all the 30 sectional tests, you will be completely ready for the mock tests. Pricing: The price for the Super 30 Test Series is $30. The sectional test series will be free of cost for the candidates who had subscribed to the test series last year and failed to pass the exam. Note: The test series has to be attempted online.